They’re the neon-coloured fizzy drinks found in gas stations, pharmacies and grocery stores, and are increasingly marketed to young children – but are they safe for their consumption? With names like Full Throttle, Monster, Tab Energy, and Red Bull, energy drinks claim to “make you more alert and give you energy” - but at what cost? According to experts, most are packed with caffeine and sugar, and can also contain varying ingredients that include taurine, an organic acid, vitamins and herbs. They can be conveniently found anywhere customers typically buy beverages, and with their flashy packaging and strategic placement next to juices and sports drinks they are proving to be a top choice with teens and pre-teens. The problem with these kinds of drinks, however, is that they can pose serious health risks to children and adolescents and should require stronger warning labels, according to a Canadian Medical Association Journal’s (CMAJ) recent editorial. “Caffeine loaded energy drinks have now crossed the line from beverages to drugs delivered as tasty syrups,” wrote Drs. Paul Hebert, Noni MacDonald and Matthew Stanbrook, in their editorial, published in the CMAJ’s July edition. In Canada, caffeine does not have to be listed on labels unless it has been added to the product separately as a pure substance. That means that consumers of energy drinks, especially young people, can develop serious side effects from high caffeine consumption, and become dependent on such products. According to Dr. Hébert, who is a critical care physician and editorialist with the Canadian Medical Association Journal, acute caffeine intoxication can cause a multitude of symptoms. Health Canada has received several dozen reports of adverse reactions linked to energy drinks, 15 of which were cardiac events. The public health organization has encouraged the public to tell them about suspected adverse reactions to energy drinks and other natural health products following a recent report of a student who suffered a seizure. While the general population of healthy adults is not at risk for potential adverse effects from caffeine, provided they limit their consumption, Dr. Richard Haber, director of the Pediatric Consultation Centre at the Montreal Children's Hospital of the McGill University Health Centre says children under the age of 12 should not be consuming energy drinks, and teens should be strongly encouraged to limit their intake of the sugary beverages. 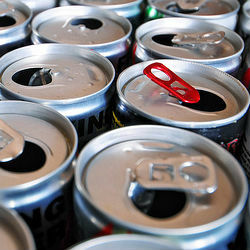 What’s more, Health Canada warns energy drinks should not be mixed with alcohol. The mix can be particularly hazardous as energy drinks can mask the influence of alcohol and a person may misinterpret their actual level of intoxication. Read the labels of all health products you consume, including energy drinks, and follow label instructions. Encourage your children to make healthy beverage choices, especially when playing sports or exercising. Water is always a better choice than an energy drink.